Montessori education is a world-wide movement, and the most popular alternative education in the United States. It’s based on the work of the famed Italian educator, Dr. Maria Montessori (1880-1952), who identified what she called “sensitive periods” of learning in preschool and elementary children, and developed a method of education based on mixing ages, collaborative learning, specialized teacher training, and very specially designed educational materials. It sets the gold standard for early childhood education. Intrinsic motivation is the best teacher. The essence of the Montessori methodology centers around respecting each child’s curiosity and interest. Montessori Guides are trained to discern that initial spark in children, and then skillfully guide them to follow through in their pursuits to satiate their curiosity. Montessori classrooms are designed as a safe and stimulating environment that invites children to choose meaningful and challenging work of their own interest. When we are intensely involved in creativity, time disappears. It is in this state that we produce our best work possible. Children of all ages are capable of having these moments of intense concentration. Montessori education cultivates children’s ability to maintain intense concentration, unleashing their full potential. Guides are trained to provide children ample time to follow through with activities, allowing each child to progress at his/her own pace, even beyond their grade level. Children process and absorb abstract concepts differently than adults. For children, direct experience rather than lecture is the best teacher. Children need to touch, smell, feel, and experience how things act and behave. 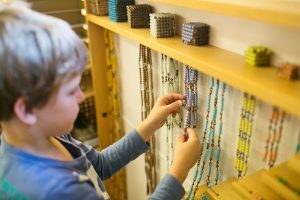 Understanding this aspect of children’s development, Montessori education provides a wealth of learning materials in a specially prepared environment designed to foster direct experience. Children understand abstract concepts (i.e. length, quantity, time, etc.) by manipulating these materials hands-on. At MSD children of the same developmental stage (i.e. ages 3-6 and ages 6-12) share one classroom. Montessori education understands that learning is social as well as intellectual. The Montessori multi-age classroom models the real world, and affords opportunities for children to interact with each other in a constructive way, mastering social and leadership skills to thrive in a diverse world. Mixed-age classrooms allow the older children to become mentors to the younger ones, and thereby be inspired to reach their own potential.